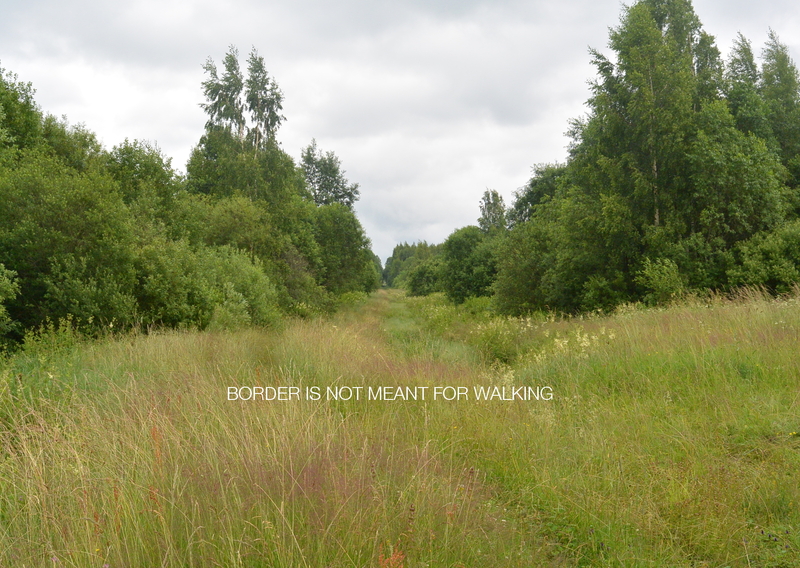 Exhibition WALK, Postcards from the Border grew out of from a residency in the summer of 2017 and a performative intervention carried out on the border on the 14th of August. The performance involved a six hour walking of the border line, that was interspersed with percussive activations/soundings of the border posts. In the course of the intervention the border was approached as a (musical) score. The border posts, which in their natural environment indicate a meeting of different territories, are translated into musical instruments during the performance. In working with the border, our interest was to bypass its political and historically dividing roles and unearth in it a function that would allow to see its surrounding environment if not with an entirely new then at least with a radically refreshed eye. During the time spent together, the border became a living organism or more even a collective of organisms who were living inside the border area (trees, stones, bog, bushes). Also the identity of the Valga-Valka town itself is an archive of numerous histories and social fabrics, being one city, but in two countries (in Estonia and in Latvia). Valga-Valka’s original German name Walk serves as an anchor in “the other end of history” for the linking of the two cities into one. The actual walking also constituted the performance as a primordial act of moving through and being with a landscape.